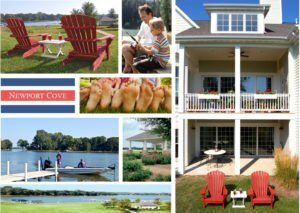 If you want to change your lifestyle (maybe move to a boating community like Newport Cove, on the Chain O’ Lakes near Antioch, IL), you may need to sell the house you live in now. Sales experts know that a fresh coat of paint and the right colors help sell a home. According to an industry survey, the right paint job can sell your home faster and for a better price (more than the cost of the paint, if you do it yourself). And, no, you should NOT paint the walls white. . .